The ancient plainchant O Emmanuel lies at the heart of this piece which was written for Merton College, Oxford, at the commission of the Chaplain, the Revd Dr Simon Jones. It is the final work in a composite sequence of all seven Advent Antiphons by seven different composers. 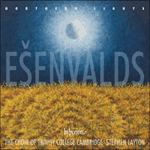 First sung by a solo voice and then by tutti altos, the plainchant is threaded through another of Ešenvalds’ gentle chorales, the glowing final cadence suffused with quiet joy and anticipation. veni ad salvandum nos, Domine Deus noster. come to save us, O Lord our God.